Home » Community » How Relevant is Your Church? Because as anointed a church planter as the Apostle Paul was, at some point those churches lost their relevance. At some point … they died. So let me ask you – how relevant is your church? Today. Here. Now. Hmm? Is it answering the questions that people are asking? Is it meeting the needs that people are feeling? Is it touching hearts with that special something we call … the Gospel? Is it resonating with people … or not? Do you remember Nokia? They used to be the leader in mobile phones. And what about Blackberry? Or Sony with their revolutionary Walkman? Or …. And my friend, churches are no different. As I look at the church landscape around my local area, it is frankly so cluttered with dinosaurs, that it feels some days as though I’m on the set of Jurassic Park! On a recent speaking tour, I stopped in a small rural town to grab a bite to eat. As I strolled down the main street looking for anything that might be open, I stumbled across an enormous real estate sign that stopped me in my tracks. What caught my attention was the property being sold. It was clear the beautiful old church had seen better days. Timber boards covered windows where stained glass once glistened; a trail of stairs leading to the church’s giant front doors was overrun with weeds; birds nestled in a broken ceiling on the front porch. As I continued down the street, I imaged the many significant moments and memories that had taken place within the walls of the once busy church. I envisaged a small group of committed individuals determined to create something sacred and beautiful, and I imaged the sacrifices they would have made to see their dream fulfilled. Hosting baptisms, weddings and funerals, the building would have once been central to the life pulse of the town. And then I wondered: what happened? At what point did this church cease being core to the rhythms and cycles of this town’s residents … and why? Was it a change in the community’s values or DNA? Was there a clergy leadership scandal that caused the church’s membership to scatter? Did the local economy fall on hard times? Had the congregation aged and eventually died out? We are experiencing an unprecedented convergence of economic, social, technological and geopolitical shifts that are widespread, rapid and fundamental. In short, we are at an inflection point in the history of mankind – a point at which the future cannot be discerned by looking to the past. 1. How does the journey from prominence to obsolescence unfold – are there discernible patterns and cycles that organizations and leaders ignore at their peril? 2. Why have such a disproportionately large number of companies, institutions or brands faded from the scene in recent years? 3. What separates the enduring from the endangered – and what can we learn from those who are prevailing and prospering in this time of disorientating change? Whether you’re a leader in a church or in a business, those are the right questions to be asking and answering. Perhaps you’re not a leader at all, just someone with a heart for seeing lives changed as more and more people encounter Jesus for themselves. 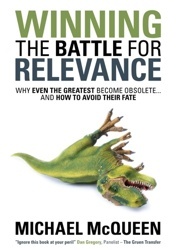 Wherever you are, whatever your passions, I want to point you to Michael McQueen’s insightful and riveting book – Winning the Battle for Relevance. It’s one of the best books that I’ve read in a very long time. And is definitely a must read for any thinking Christian. How relevant is your church? Check it out. Tithes were never about money. We need the Spirit back in the local church…which was, in the New Testament, peoples homes. More intimate. So my understanding is, church is not relevant because its turned into a business model. Church use to scare me for lots of reasons but as I grew to understand more I find I yearn to go to church. I feel replenished and my son and I feel the same; a kind of pressure in our chest, just before we receive the Eucharist, then we feel great and uplifted. I see church as a way of thanking Jesus for what we have and the strength to get through each week. I cannot ignore the fact that the church not so far down the road from us is less open for mass due to a lack of parishioners attending. That did have an impact on me…..if my church closed I would miss out on the Eucharist and the chance to pray in front of the tabernacle! But I am involved in helping with the youth activities at church and young people are so interesting. Some like the traditional ways of the church and not in favour to change too much. Many people depend on a good priest or pastor who can connect and deliver. I know that was my magnet back to going to church as I could listen, be quiet and reflect but leave with an understanding for wanting more. If people would offer up a little more time to read more scripture I think many of us would be inclined to seek out God. When the phrase “search for relevance” is used my thoughts connect with those who update the “forms” of church in order to attract outsiders. This could relate to the building, music, style of worship or the types of meetings being run. In themselves alone, I do not believe that this makes,us more relevant. I actually think that it more about competing for the attention of a public who are attracted to the entertainment being offered. Sometimes this can appear outwardly successful, especially if we measure success by the number of people in attendance or the quality of the music team. All very superficial perhaps. On a deeper level, relevance is about our attitudes in relation to the Holy Spirit of God. Grieve Him or quench Him and the very thing that makes church (a meeting involving two or more believers in Christ) relevant, appealing or alive is gone. As such, what value do we place upon our attitudes of humility, kindness, patience, love, mercy in commitment to the Lord we serve? On a personal level I am very wary of using business models to promote relevance in church. If we seek to please the public then the temptation is to also water down the message God wants us to preach. Compromise the message and we will risk losing our way entirely. Amen, the Holy Spirit of God. I also think that should be the key and exactly the same thought came to my mind when I read the word ‘relevance’. I also totally disagree that we should become relevant to anyone and anything else. I believe that the Gospel is relevant and powerful. And when PREACHED IN IT’S FULLNESS, without taking away (Sadducees) or adding (Pharisees) to it (and that includes the ministry of the Holy Spirit) will be so radical and more relevant than anything imaginable! But we have added and watered down the gospel to such an extent that we are left unfulfilled and now we look for ways to replace the Holy Spirit of God. Dangerous ground!! The need for CHURCHES – “The Gathering” – will always be there. Peoples’ needs remain the same and they face the same daily and spiritual challenges that the Romans, Thessalonians, Galatians and Corinthians faced when Paul wrote to them. I have visited glass stained cathedrals with not more than 20 people at the service. I have visited warehouses and school halls with no religious paraphernalia with hundreds of people worshipping, praying and sharing God’s Word. The building is not relevant. What happens and how it happens in the building have to be relevant. The model of the “Gathering” is spelled out in the Bible and it remains relevant. Is the problem of relevance with the teachers and the leaders of the Church? Why do people change from one Church to another? Is the building relevant? It seems that sometimes the building constricts the teacher or leader to the age and style of the building. There is more reverence in the cathedral than in the school hall. The organ is more appropriate. The leaders must wear religious vestments..and so on. The true Church doesn’t change in its message of Love and how it shares it with people, with Love. In the day and age where people are screaming to be heard (think youtube, twitter, face book etc) the church insists on being irrelevant when they want people to walk in, sit down, shut up and listen! Not only that, but you wouldn’t expect someone to listen to someone on a street corner who they don’t know, but when new people (in a mobile society there are a few of us) walk in they are expected to listen and follow someone they don’t know (or trust)! In Jesus day, that was the way things were done, so that is the way he did things. Nowadays people are relational and want to be heard. Why not change the way things are done so things are more dialogue focused, where people get to be heard as well as listen? Ok, this happens better in small groups than in a mass gathering on Sunday, but if this is what the Church needs to do to be relevant, why not change with the times? Any family normally knows what is going on with others in it – except the church. Why not change the sunday sermon to a time where we find out what God has been doing (challenging and growing) – it may encourage someone, give others ideas, and might just be relevent. Is the church more concerned about following tradition so people inside can be comfortable, or does it mind being uncomfortable to make it easier for others to find God? Hi Jeffrey, I see where you are coming from but I would like to suggest a slightly different angle. What if the people in Jesus’s times were just as desperate to be heard as we are? Absurd! Think about it for a moment; woman oppressed by the unfair execution of the law, poor people unfairly taken advantage of, the clergy taking advantage of their positions, the gentiles left with no place in the temple… I think they had exactly the same desire; to be heard. That is why I think Jesus came at exactly the right time – when the people wanted to be heard. He was relational, cooking breakfast for his disciples on the beach, eating in a sinners house and practically illustrating the love of God the Father by healing the eyes of the blind… In fact he was far more relational than the church today! He listened and heard the needs of the people; calling the priests a brood of vipers, turning over the tables in the temple and chasing them out because they prevented the gentles to have a place in the temple. I say that; because we exclude the Holy Spirit of God and prevent the Spirit to come into our churches and minister to God’s own people, is the reason we have such unfulfillment in people attending and visiting church today. I suggest we return to how Jesus ministered to the people. LET GO AND LET GOD!